Samsung has turned out another impressive flagship phone this year, the Galaxy S 4. In my review, I found there's no single defining feature that makes this smartphone rise to the top, but rather its unique combination of hardware, software and user interface upgrades. On the hardware side, there's a gorgeous 5-inch display that has an incredibly small bezel, making it look big but feel no bigger than the 4.8-inch Samsung Galaxy S III. The Galaxy S 4 camera gets a bump in megapixels from 8MP to 13MP for even bigger enlargements and more versatility with cropping, while retaining image quality. And there are new sensors on board, including a barometer, humidity sensor and temperature sensor. Software is where the Galaxy S 4 really shines. There are a slew of new and very useful camera modes, including a best shot mode for group shots (my favorite), eraser mode for removing people who walk into the frame and a time-lapse shot mode, which compiles key frames into one image. Plus, there's a health and fitness tracking app and a universal remote control, among others. For first-time smartphone users, there's an "Easy Mode" with a pared-down interface and for more advanced users there are gesture controls and eye tracking. In all, the Galaxy S 4 sets a high bar, but it doesn't dominate the Android smartphone landscape. It has strong competition from the new HTC One, with its great camera and beautiful styling. When I heard that the Samsung Galaxy S 4 was going to have a 5-inch display, my first thought was that the phone would be way too big for me. It's not. With its ultra-thin bezel, the S 4 measures 2.75 inches wide, or 0.03 inches narrower than the Samsung Galaxy S III, which has a 4.8-inch display. The S 4 is also thinner (0.31") than either the HTC One (0.37") or the S III (0.34"), though not as thin as the iPhone 5 (0.30" which beats the S 4 by a hair, just 0.01-inch). Unfortunately the S 4's polycarbonate back feels just as plasticky as the S III and is no match for the HTC One, with its beautifully-machined aluminum case, or the iPhone 5. The Galaxy S 4 has a 5-inch Full HD Super AMOLED display (1920x1080), which is slightly larger than the S III's 4.8-inch HD display (1280x720) and the HTC One's 4.7-inch Full HD LCD display (1920x1080). The extra space for web browsing, watching videos and reading eBooks is noticeable and appreciated. And with a pixel density of 440ppi, it has one of the crispest displays, matching the Droid DNA and just slightly below the HTC One at 468ppi. Like Samsung's other phones with Super AMOLED displays, you'll immediately appreciate the bright, poppy colors, crisp text and great contrast. And, it's protected by Gorilla Glass 3, the latest and greatest protection against scratches and damage from falls, though I still wouldn't recommend intentionally abusing the new S 4. One area it doesn't fare as well as other displays is in bright sunlight and off-axis viewing. Top honors in that arena still go to the True HD IPS display found in the LG Optimus G and Super LCD 3 in the Droid DNA. Call quality and speakerphone on the S 4 were very good. The sound profile for music playback doesn't have the resonance of the phones that have integrated Beats Audio or the HTC One's BoomSound, but sound quality is very good. One drawback, though, is that the speaker is on the back, so sound can be muffled on soft surfaces, like your hand. 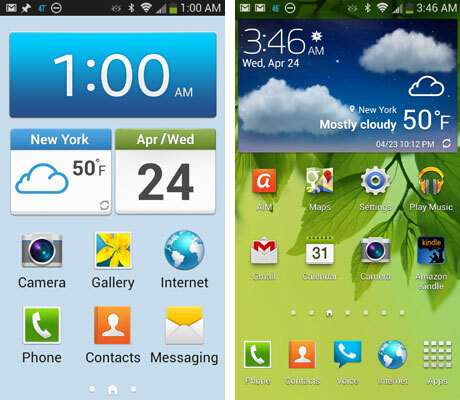 The Galaxy S 4 I tested supports Sprint's 4G LTE networks, but LTE hasn't rolled out yet to New York City. The 3G network Sprint bumps down to performed as expected and speeds in LTE areas should be comparable to other 4G LTE networks. The Galaxy S 4 will be available on AT&T, T-Mobile and Verizon. The S 4's quad core processor and 2GB of RAM made quick work of web pages and readily handled graphics and processor-intensive games. The Galaxy S 4's 13MP camera takes crisp photos with accurate, though not rich color. And, it does a good job in low light situations, especially in HDR mode for stills and night shot mode for regular shots and video. Its biggest competition is the HTC One phones–the Droid DNA (Verizon), HTC One X (AT&T) and HTC EVO 4G LTE (Sprint)–which take better, richer-looking shots, as well as the new HTC One. The new HTC One's 4MP camera, which was specifically designed to address low-light shooting, supports the fact that megapixels are definitely not everything. In all, HTC still makes better cameras, though not by a wide margin. Samsung spent a lot of effort upgrading the camera taking experience. I love the Best Face mode, which lets you choose the best shot of each person in a group and composite the faces into one image. It worked really well with my not-so-cooperative three children. Another favorite is Eraser mode, which lets you "erase" people or objects that move through the frame while you're taking a picture. More fun than useful are Drama mode, which composites multiple action photos into one frame; Dual Camera mode, which shoots the front and back cameras simultaneously; and Sound and Shot mode, which lets you add a 9-second audio clip to pictures. There's also a great app that comes preloaded called Optical Viewer, which can capture text for inputting business card information into your contacts or translate text—perfect for reading menus while in foreign lands. Video quality is very good, but not quite as good at the Droid DNA and other HTC One phones. 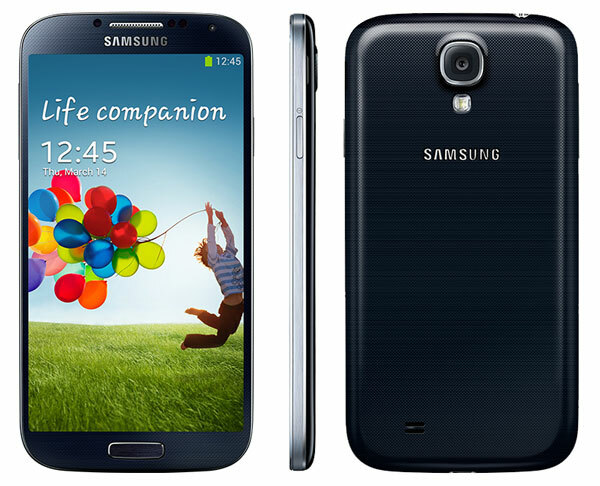 The Galaxy S 4 ships with Android 4.2 Jellybean and Samsung's next-gen TouchWiz skin. TouchWiz now has a transparent status bar and a new Notification Panel that delivers more controls with one touch on/off functionality. It also lets you decide the 5 controls you want to always appear at the top of the notification window. More striking, though, is an alternate home screen mode called Easy Mode. It features larger buttons with large fonts, the ability to pin contacts for speed dialing and a limited number of apps to pin to its 3 home screens (regular mode has 7 home screens). It's great for first-time smartphone users or older people who want larger fonts. Samsung also added a few new interface options. Air Gesture, as its name suggests, lets you wave your hand in front of the phone's infrared sensor to perform simple tasks like scrolling down a web page or flipping through a photo album. I can see it being helpful if you're cooking and want to read more of a recipe. Air View is more useful, letting you hover your finger over a date on a calendar to see your appointments or an email to see a preview of the message without opening it. You can also hover to magnify content of web pages. Smart screen, which monitors your head movements to scroll text and start/stop video was hit or miss and not all that useful. In general, all of these alternate ways of interacting with the S 4 only work with Samsung's apps. I like the Samsung keyboard, but love the optional Swype keyboard that Samsung loads on its phones. The Swype keyboard quickly learns how you swipe your finger from letter to letter to create words. making accuracy not all that important. "Typing" this way is super fast. I'm also a huge fan of the WatchON app, which makes use of the infrared sensor to turn your S 4 into a remote control for your TV and home theater gear (works with any brand). It also has a built-in guide that provides suggested shows, as well as listings. Another useful app that makes use of the S 4's onboard sensors is S Health. It helps you track calories burned by sensing movement throughout the day. You can also track what you've eaten and input other exercise activities. The app is currently compatible with a couple of scales, but there are plans to expand the offerings to other health monitoring devices like blood pressure monitors. S Health also tracks temperature and humidity, which is helpful for my wine cellar, though I'm not clear on the connection to health. The Samsung Galaxy S 4 comes with 16GB of onboard storage. Plus, it includes an microSD card slot for up to an additional 64GB. I found the battery life to be average under normal usage. I had no trouble getting through the day, with occasional checking of email, phone calls and web browsing. However, that battery runs down fast if you're doing processor and screen intensive tasks, such as playing games or watching video. The Samsung Galaxy S 4 is available on Sprint starting April 27 for $149.99 for new customers (update: pre-orders are already sold out) and on AT&T for $199.99 with a new two-year agreement. The Sprint version is available on Amazon for $149.99 for new Sprint customers with a 2-year agreement or $249 for current customers with a new two-year agreement. T-Mobile will be offering the Galaxy S 4 for pre-order starting on April 29 and Verizon has said it will have the phone but hasn't set a launch date. If you want a high-end Android phone, the Samsung Galaxy S 4 delivers a beautifully balanced package of high-end hardware and software extras. Best of all, it makes a 5-inch display actually seem reasonable, thanks to an incredibly sleek design. For first-time Android smartphone users, the S 4 is the best choice. It delivers a full Android experience out of the box—no trip to the Google Play app store needed until you want to play games. More advanced users should note that the S 4 still has the plasticky feel we've come to expect from Samsung and the S 4 doesn't have the best camera. So photo snappers will want to take a hard look at the currently available HTC One variants—the HTC EVO 4G LTE (Sprint), Droid DNA (Verizon), HTC One X (AT&T)—and HTC One, which will be available from the major carriers. And, not much has changed on the iPhone 5 versus Android front. If you like a smaller phone and want access to what's still the best app store, you should choose the iPhone 5. The app gap has closed, though, to a point where fewer and fewer apps aren't available on Android at launch or a few months after. And the best map and navigation apps are still coming out of Google. If you find yourself squinting to read the iPhone's 4-inch display, the S 4 may cause you to make the shift. Bottom line, whether you're an Android newbie or a veteran, you'll be more than happy with the Samsung Galaxy S 4. And even iPhone acolytes may be converted.